International Symposium on Visual Computing 2009 . Parallelization of Poisson reconstruction using domain decomposition. Abstract: In this work we describe a parallel implementation of the Poisson Surface Reconstruction algorithm based on multigrid domain decomposition. We compare implementations using different models of data-sharing between processors and show that a parallel implementation with distributed memory provides the best scalability. 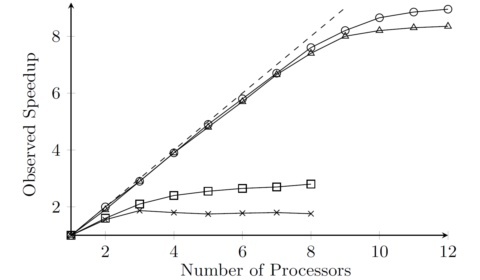 Using our method, we are able to parallelize the reconstruction of models from one billion data points on twelve processors across three machines, providing a ninefold speedup in running time without sacrificing reconstruction accuracy. Hindsights: See also the original Poisson surface reconstruction paper.